Will Daimler’s Self-Driving Truck Threaten Some Jobs? No doubt many people cringe at the idea of self-driving vehicles. What happens in the case of an emergency when there is no human to take control of the wheel? 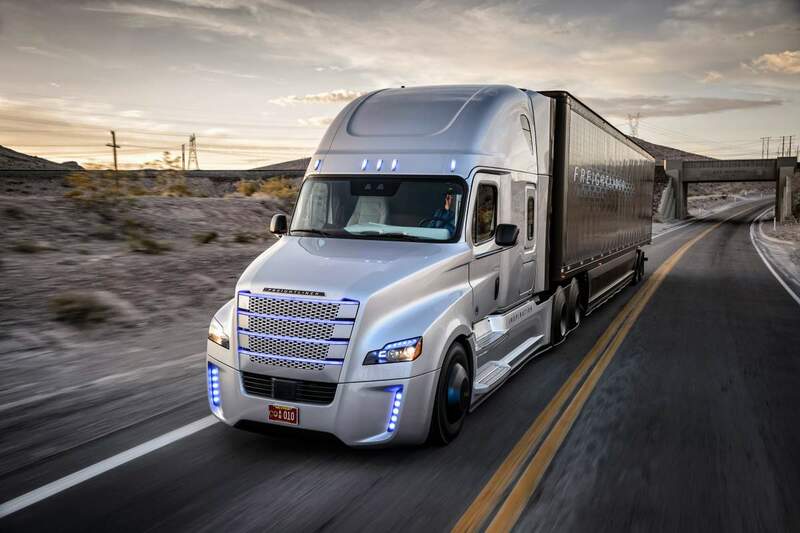 Automaker Daimler, which owns Mercedes-Benz, unveiled the first truck of its kind, the Freightliner Inspiration, which essentially drives itself. We say essentially because there is still a human behind the wheel to take control if something unexpected should happen. On surface roads the driver still controls the truck, but on highways the truck goes into autopilot mode – lane lines are detected using cameras and will keep the truck on the right path and at a safe distance from other vehicles. Once approaching the right exit or any other unfavorable situations, the truck beeps to alert the driver to take the wheel. If the driver doesn’t respond, the Freightliner Inspiration will slow down and eventually come to a complete stop. Additionally, according to Daimler, while on autopilot mode, even on the highways, the driver can override the steering or brakes in case of extreme emergencies. Yet, the truck is made to stay in it’s own lane, so passing slower vehicles is not one of the technology features. Unfortunately, for those truck drivers lacking sleep, napping while the truck is on autopilot mode still doesn’t seem like an option, but he or she can relax and do a couple of other tasks. So, the question remains, what’s the point of a self- driving truck, when you still have to employ the driver to sit in it in case something happens – is our love for technology causing us to be lazier than before? For the estimated 3.5 million truck drivers in the U.S. alone, a self-driving truck may seem useless and more like a threat to their source of income. Fortunately for them, there is no piece of modern technology that can take the place of a human brain so, for now at least, it seems like their jobs are safe. Alex Davies, associate editor for Wired, stated the no truck company will ever use the term “driverless” and we are far from having cars that can completely drive themselves. According to the Centers for Disease Control and Prevention (CDC), the average commercial truck driver’s life expectancy is 61 years – a long way off from the average life expectancy of 79 years. So therefore, these self-driving trucks may take the burden off of truck drivers during the most tedious part of their job – driving countless hours on the highway. Not to mention, truck drivers usually spend a lot of time in solitude and the extra time they would have to themselves, while the truck is on autopilot, could be a way for them to communicate with the outside world, whether through the phone or social media sites. So maybe this technology is one that will make us more efficient, not lazy. What is your opinion of the Freightliner Inspiration?